At last the two places I've worked, we've had boxes upon boxes of dead-tree files going back to the 90s. I presume thousands and thousands of other businesses have the same. Obviously, most of that will be machine-printed, and only a fraction will have cursive writing. Both Chris and I have provided concrete observations about the lack of use of cursive writing in today's workplace. That the two of you don't recall seeing it is hardly concrete. It's not a detail anyone would expect you to remember, if you had seen it. You've been able to provide no tangible examples where cursive writing is an ongoing and important part of the workforce, any job sector, any company, or any job other than the highly specialized role of a caligrapher....but its manifest necessity and vitality in the smooth functioning of today's business world is NOT one of them, no matter what you theorize, and no matter how little to no evidence you provide to the contrary. I never said anything about it being manifestly vital, and I actually said that education is not just about the work place. We learn to read and write so we can communicate with family and friends as well, and I've referred to cursive's role in that. They would still be literate. They read English just fine. We're not talking about language, but script. What if those letters were written in shorthand (real shorthand as it used to be taught...in schools)? I didn't say they wouldn't be literate, but there are degrees of literacy. I don't know much about short-hand, but how valid a comparison do you really think it is? Compared to cursive, how generally was it taught, and for how long a period of time? How many important documents were (are) written or preserved in short-hand, compared to cursive? Short-hand serves basically one purpose (transcribing or summarizing speech), while cursive is for general purpose writing, so it's more useful, and might show up just about anywhere. Also, one can find cursive charts and transcribe the letters. The letters aren't lost. I don't think anyone's saying they're lost. But let's say there's a situation in which an older person, during a business meeting, writes a quick note, and hands it to a younger colleague, who wasn't taught cursive. Maybe he's telling him to go out and get the such-and-such file, or to employ negotiating tactic #503, or whatever, so he just dashes off a note. And he just happens to use cursive, because that's how he writes. You can say, "In my decades of business experience, I've neither seen nor heard of any such thing." Or you can say that's what texting is for, or that the old dude should have known to just print. Meanwhile, Joe the Recent College Grad is googling a cursive chart. It's not a far-fetched scenario, but I think it's an absurd one, that should be avoided by fully teaching the poor kid how to read and write. Without using cursive, I can read the language of our culture just fine. We're reading this, right? You're assuming the records in question were written in a standard script, correctly, and still legible. No, I'm not. Some cursive will be easier to read than others. Some print will be easier to understand than others. By way of "tangible examples," I submit this photo of a pick ticket I "tanged" this afternoon. 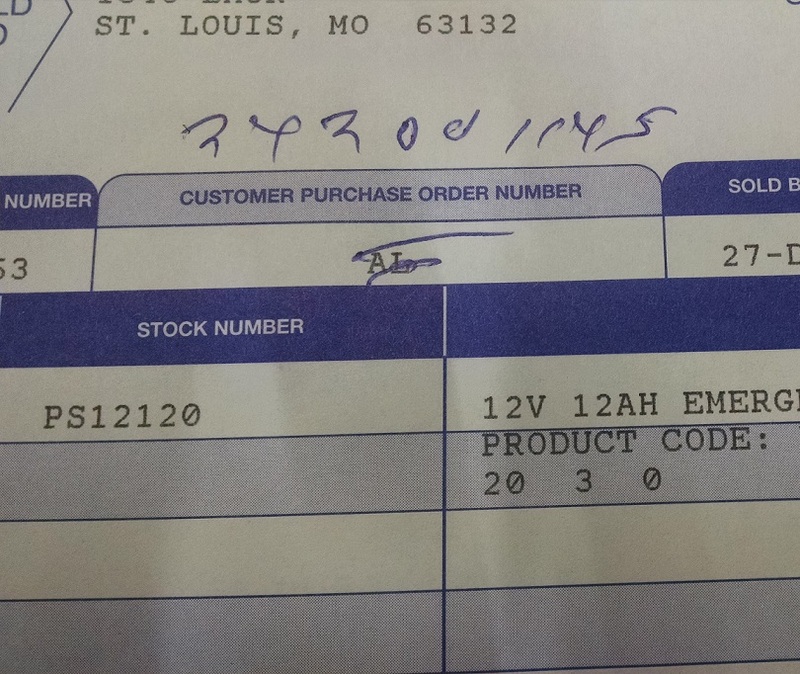 Someone tried to scribble in a job name or PO number, which the millennial in accounts receivable will need to enter into the computer. That's not cursive, and I'm not sure whether it's letters, numbers, or both. The one thing I'm sure of is that I've never seen a sample of cursive more difficult to decipher than that mess. And since Mike is so rigorous about concrete examples, I wrote some cursive on another pick ticket today. WHERE IS YOUR BLOCK PRINT GOD NOW?! In this remarkable bastion of libertarian-ism I am shocked, SHOCKED I tell you, to see so many rugged individualists lamenting the government schools not teaching something they see as important. If you feel strongly that your progeny need to learn something that the government schools do not teach I would suggest that you pull up your big boy or girl pants and undertake to instruct your get yourselves. Question about the atomic clock... specifically the time signal. How do they adjust for the time lag between a clock 10 miles away receiving the signal vs a clock in, say, Eastport, Maine, about 2,300 air miles away? Even though the signal travels at 186,000 miles per second, there's still a measurable lag. WRT the Eastport Maine, question, basically, the WWV time signals define the time for any place it is intended for. Precise corrections are attainable by the user, if that much precision is involved. It takes about 1/8 of a second for a radio signal to circle the globe, but the bouncing of the signal back and forth from the ionosphere to earth must be taken into account. Keep in mind, this is sort of like the question of "how many decimal places of pi do you need to use?" If you "need" pi to 84 decimal places, that information is either available or deriveable. For time, high precision is probably only necessary to confirm relativity theory and the like, for example. WRT to the GPS satellites, I do not know for sure, except that the very lag you speak of results in phasing differences between satellite signals and these phase delays are used to derive your position. So presumably, the times on each satellite are preset to be identical through all of them or reset from the ground after a stable orbit is achieved. I do know for sure that they don't use pendulum clocks to keep accurate time in the GPS satellites. Only in those steam-punk satellites. If cursive lapses into history, I'll count that as a win on many fronts. The biggest being while print can be not legible, cursive is RARELY legible to anyone other than the writer. Even then, it can be iffy. I think if it lapses, general English skills will also lapse and nothing will be legible. I've got several correspondents who use cursive. I'm still wondering what "pfbibxly" meant in in one recent letter. I'm sure that's an "i" because of the dot. At any rate, her pfbibxly is fine, according to her Doctor. I have this crazy idea that, if cursive were so thoroughly illegible to anyone other than the author, people would not have been using it to communicate with each other for hundreds of years. Unless we're to believe that all those letters back and forth were just gazed at uncomprehendingly. Ayup. I gazed at "pfbibxly" pfbibxly. Exactly what "important" classes are being skipped over because they are teaching cursive at that time? How to recognize white privilege. Actually, I know because most large corporations have document retention and security policies that would preclude 20yo documents from being kept. If said documents were so critical they needed to be retained, they would have been converted to electronics records, for among other reasons, to ensure they remain usable over time. Physical storage is expensive and difficult to manage. Physical documents are prone to damage, loss, fading, etc as well. Handwritten documents of importance just aren't a thing anymore. I'm looking at it more broadly. If you consider a student has N educational hours in their public school "Career", then by removing cursive, you free up minutes for other instruction. Obviously you don't need to teach 3rd graders how to manage finances, but maybe there are other subjects or topics that could be taught to them or teach things that would have otherwise been delayed till a later grade. When those items are moved back, you move yet other delayed subjects into the newly freed slot, creating a knock-on effect giving you more time when the students are older. I remember learning cursive in 2nd grade. We spent a few weeks on it, learned how to write it, and then never went back. 4th grade we revisited it so we could learn to write checks. We had a whole little classroom economy - and that's where I learned how to balance a checkbook. On the other hand, I remember in 10th grade economics we were each assigned a career - then told to buy houses, cars, and other things based on what we could afford. Every other student based their purchases off of monthly payments, because that's what was taught. My teacher was confused that I, assigned a well-paying career, chose to buy an inexpensive, used car and live in an apartment to save up for a down payment for a house. If we're going to teach finances, we've gotta start higher up. Or hire my 4th grade teacher. All shorthand systems are approximations. Ever read the first draft of a trial or deposition transcript, generated by a certified court stenographer? Actually, I know because most large corporations have document retention and security policies that would preclude 20yo documents from being kept. If said documents were so critical they needed to be retained, they would have been converted to electronics records, for among other reasons, to ensure they remain usable over time. You know what? That businesses don't have boxes of old paper files in storage? The ones I've worked for do, so I'm not sure what you're saying here. But the electronic copy may be (and probably is) nothing more than a scan of the paper document. Just a slightly more modern variant of a microfiche. Scanning a document written in cursive obviously doesn't make it unnecessary to read cursive if someone needs that document down the road. The handwritten comments may have been typed into the new, electronic record. Which still means that any cursive has to be read and understood by someone. Perhaps there's a third way. As others said, cursive is taught fairly early in elementary school. At that time, there are few other things you would be teaching youngsters that aren't just basics. Most kids are still learning basic words, spelling, and sentence structure at that time. IMO, the failing is not teaching cursive. It is that they fail to teach basic writing and reading comprehension and force kids to learn it or fail and retake the grade. If someone mangles their letters a little when writing, but they write good sentences with correct spelling and grammar, you can still read it. 1. How much print style writing was done before the printing press was invented? I figure this is hard to know since literacy was also probably less common. Forgot that when you sign your name, you use cursive. Your signature is kind of important. There is: OCR -- Optical Character recognition. It's maybe 85% effective at getting printed text more or less correct. Good luck using OCR on cursive handwriting. Full cursive (草書) is really hard to read and I don't think that people use it in daily life (I could be wrong though). My mom spent a lot of time as a secretary back when that was an acceptable name. She knew shorthand. Perfectly happy to leave Christmas lists out in plain sight. Cursive is cruelty. I learned cursive but never held a pen correctly and was schooled by a left hand exorcist of an old teacher. My fingers always hurt so by high school I had largely converted back to print. The military and eight million pointless logbook entries finished cursive off for me. That is probably the first legitimate and contemporary use of cursive mentioned in this thread. Real signatures are becoming a lot less common, and I know a lot of people who have a random squiggle for a signature, not anything actually readable. I mean, back in the day we signed checks with our signature, how often is that today? My check register has slipped back behind the year. Nearly everything I pay for is electronic. Mostly it's just electronic signature for credit card purchases these days, and even that's being seen less. Being back in college, I mostly use cursive to torture teachers who assign in-class writing assignments. Yesterday I went through a checkout line at a grocery store. When the time came to "sign" the credit card doohickey it came out as a scribble. Older lady (older than me, had the air of a retired school teacher) commented somewhat condemningly, that you couldn't read my signature. I looked her dead in the eye and told her I had legally changed my name to "Illegible Scrawl". Older gentleman behind her snorted, she just went blank, kind of like she had locked up.